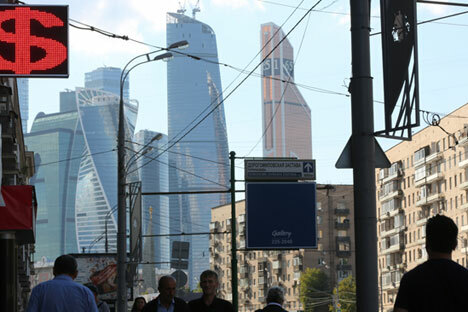 Skyscrapers of the Moscow City business district stand beyond a foreign currency exchange bureau. Moody's international rating agency forecasts that Russia’s GDP will grow by 1 percent in 2017, according to the agency’s report released on Jan. 11. "Moody's projects that Russia, the largest economy by far among the nine countries, will record positive, albeit modest, real GDP growth of 1 percent in 2017 after two years of recession. This upturn will lift the broader region due to trade and financial linkages," the agency said. According to the agency’s experts, "stabilization of oil prices has eased the direct and indirect economic and fiscal pressures on the nine rated sovereigns in the Commonwealth of Independent States (CIS) region." "Still, the region's overall credit outlook for 2017 is negative, driven by subdued economic recovery, external vulnerabilities in those countries with high foreign currency debt and the likelihood that political considerations will delay structural reforms that would bolster potential growth," Moody's Investors Service said in the report. Moody's forecasts median growth to rise to 2 percent in 2017 from 1 percent in 2016, and a further rise to 3 percent in 2018.